What’s your favorite kind of milk? Creamy chocolate? Fruity strawberry? No matter which flavor you like, you know milk tastes great. But did you also know that it’s good for you? Milk has so many important vitamins that help kids like you grow strong and stay healthy! 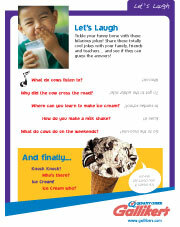 Check out Galliker’s cool activities to learn more about milk and all our awesome products, like ice cream and juice. We’ve got puzzles, funny jokes and even a trip to the farm! Tickle your funny bone with these hilarious jokes! Put your thinking caps on. 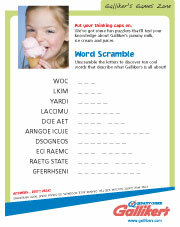 We've got some fun puzzlers that'll test your knowledge about Galliker's yummy milk, ice cream and juices. Have you always wondered how milk and ice cream are made? Take a trip with us to a dairy farm and see the cows that give us milk. 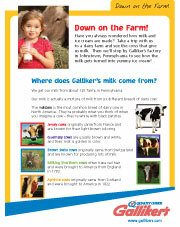 Then we'll stop by Galliker's factory in Johnstown, Pennsylvania to see how the milk gets turned into yummy ice cream!